Trade ministers from a dozen Pacific nations are shown in Atlanta on Oct. 1, 2015. The Trans-Pacific Partnership would create a free-trade zone among 12 nations around the Pacific, making it the world's largest. The countries within its scope account for 40 per cent of the world's economic output. Last November, the U.S. and New Zealand governments released versions of the full text of the agreement. On Jan. 25, Canada's Liberal government confirmed that it would sign the deal, though it still needs to be ratified by a majority vote in the House of Commons before being officially introduced. 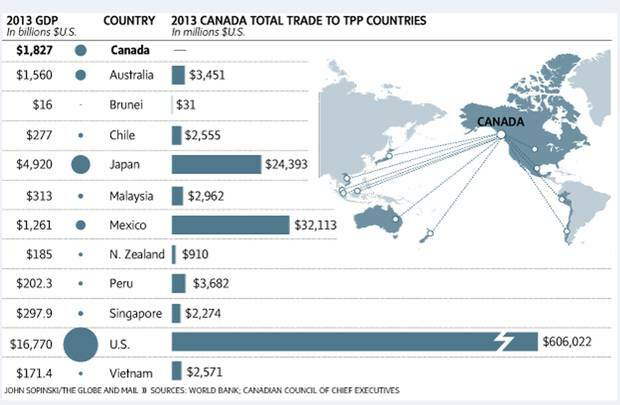 Is the TPP a fair, balanced deal for Canada? 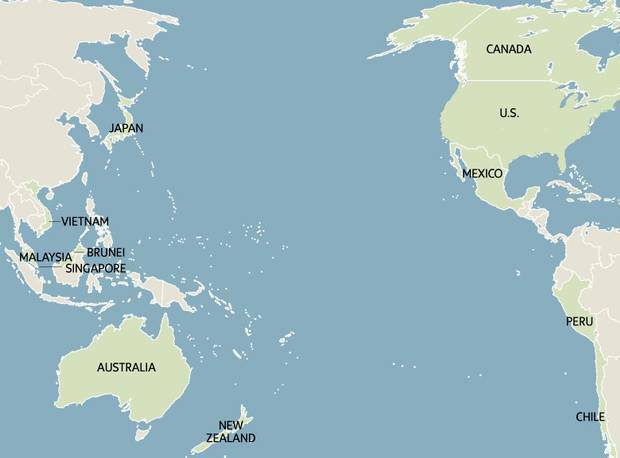 12 – Countries involved in the Trans-Pacific Partnership trade deal. Ratification would create the largest trade zone in the world, spanning four continents and 800 million people. $28.5-trillion – The combined gross domestic product of the 12 trade-pact countries which, it is estimated, collectively produce 40 per cent of the world's economic output. 45 – Per cent of a vehicle's content that must come from Canada to avoid import tariffs, a change from the North American free-trade agreement (NAFTA), which established that 62.5 per cent of a vehicle's content must be local. $4.3-billion – Subsidy the government has promised over 15 years to protect current dairy, chicken and egg farm revenues. TPP countries get duty-free access to 3.25 per cent of Canada's dairy market and 2.1 per cent of its poultry market. $158.6-billion – Average annual value of Canada's exports of metals and minerals to TPP countries from 2012 to 2014, according to numbers provided by the federal government. The sector includes petroleum products, potash, precious metals, iron, steel, aluminum and nickel. 51 – Total number of countries, if TPP is ratified, with which Canada will have free-trade agreements, which account for roughly 60 per cent of the global economy, according to data released by the federal government. Canada and Mexico have long enjoyed privileged access to the United States, the country with the biggest economy in the world. That special status will be diluted under the Trans-Pacific Partnership. Instead of a group of three, 12 countries would share in the perks of TPP membership. At a high level, TPP is similar to NAFTA in that it involves pledges to reduce or eliminate tariffs on a wide range of goods and services. It also sets out rules for resolving disputes. One of the biggest differences will be felt by the highly integrated North American auto sector. Current NAFTA rules require that 62.5 per cent of auto parts come from North America. Under the TPP, autos manufactured in Canada must meet a new standard that 45 per cent of the cost be based on parts made within the TPP. Canada called this a victory that would allow for more exports, but Unifor, the union representing Canada's auto workers, condemned the deal as "outrageous" and warned that it will kill jobs. Monday's deal may not be the end of NAFTA, however. The TPP deal still requires the approval of the U.S. Congress, and senior Democrats and Republicans expressed strong reservations in response to the details. Canada's Trade Minister, Ed Fast, said that Canada's support is contingent on a positive vote for the deal in Parliament following the Oct. 19 federal election. Unlike Canada's recent trade deals with the European Union and South Korea, the TPP is not limited to highly developed nations. Critics of the deal say the inclusion of countries such as Peru and Vietnam will see well-paying jobs exported to low-wage economies where workers have less protection from exploitation. Canadian officials countered that the deal includes strong and enforceable rules banning child labour and entrenching the rights of workers in member countries to unionize. The TPP also reduces hurdles for employees to work temporarily at affiliate offices of their employer in other member countries. This measure is aimed at easing business travel. Officially known as intracompany transfers, these arrangements have attracted controversy at times in the context of the Canadian debate over temporary foreign workers. The chief executive officer of Royal Bank of Canada apologized in 2013 after a controversy emerged involving the outsourcing of information technology work that involved intracompany transfer visas. Free-trade deals, including NAFTA, have provisions for resolving disagreements between states. They also include investor-state provision that allow private companies to contest government decisions. For instance, Canada was required to pay forestry firm AbitibiBowater Inc. $130-million in 2010 after the company won a NAFTA Chapter 11 challenge against Newfoundland and Labrador's decision to expropriate its assets. The investor-state provisions of Canada's Comprehensive Economic and Trade Agreement (CETA) with the European Union was one of the main sources of controversy against the deal from within the EU. Canadian officials said Monday, Oct. 05 that the dispute-resolution provisions in the TPP are similar to those that are in CETA and NAFTA. Canadian consumers can expect to see lower prices over time for one of their biggest purchases: vehicles. The current 6.1-per-cent tariff on passenger vehicles from Japan will be phased out completely over five years. The new lower content threshold for auto parts should also reduce costs. The elimination of a wide range of tariffs should lead to more choice and lower prices for consumer goods. Canadian companies will gain a competitive advantage over their rivals from non-TPP countries who will still face the existing tariffs. This is particularly important given the improved access Canadian firms will have to the Japanese market, which ranks third in the world in terms of gross domestic product behind the United States and China. China was not invited to join the TPP negotiations and the deal is widely viewed as a challenge to China's growing economic influence in the Asia Pacific region. HOW MUCH TRADE HAVE WE DONE WITH THOSE COUNTRIES IN THE PAST? Bottles of Canadian whisky will be well-aged by the time producers cash in on the Trans-Pacific Partnership. Malaysia will take up to 15 years before dropping its whisky tariffs. Vietnam will drop its 55-per-cent duties within 12 years. These are the types of details that make up the trade agreement, as varying timelines and tariffs apply to different products and countries. Canadians are known abroad for their ice wine and Canadian whisky and both products will have fewer barriers to entering TPP nations under the deal. Australia and New Zealand will drop duties on Canadian wine right away, while Japan will follow suit within seven years. Canada's concessions on auto imports quickly came under fire Monday as the TPP deal was announced. Canada will allow vehicles to enter the country from Japan duty free within five years, yet the United States negotiated a 25-year timeline before erasing similar tariffs. The privileged access of Canada's auto parts manufacturers to the North American market will also be diluted under the deal. Current rules under the North American free-trade agreement (NAFTA) require that 62.5 per cent of auto parts come from North America in order to avoid tariffs. Under the TPP, autos manufactured in Canada must meet a new standard that 45 per cent of the cost be based on parts made within the TPP. The Canadian Vehicle Manufacturers' Association issued a short statement Monday saying it is "concerned to learn of a significant differentiation in the negotiated tariff transitions achieved by Canada and the United States." Canada expects the TPP will be good for a large number of agricultural sectors as new export markets open up, thanks to the elimination or reduction of tariffs. The timeline varies by country and by product. Access to the large Japanese market is a key prize for TPP members. Once the deal comes into force, Japan will immediately end tariffs on 32 per cent of its agricultural imports, while other tariffs would be reduced or eliminated over the next 20 years. Australia, Malaysia and New Zealand will eliminate more than 90 per cent of their agricultural tariffs immediately once the deal is in place. Canola and processed food and beverages were highlighted by Canadian officials as export sectors that should benefit under the deal. Canadian beef and pork producers are among the big winners under the TPP deal. From 2012 to 2014, Canadian producers exported $2.6-billion worth of pork and $1.3-billion worth of beef to TPP markets, though much of that was to Canada's NAFTA partners. Within 10 years, Japan is promising to eliminate its tariffs on a wide range of pork products, while the current 50-per-cent tariffs on beef will be reduced to 9 per cent within 15 years. Vietnam will move more quickly, eliminating tariffs of up to 31 per cent on fresh and frozen beef within two years. Canadian dairy farmers marched with their cows and tractors on Parliament Hill last week, urging the Conservative government not to surrender Canada's system of supply management during the closed-door TPP talks. Other TPP members, including New Zealand, had made clear they wanted major dairy concessions from Canada. When the deal was announced Monday, Ottawa said it would pay $4.3-billion over 15 years to dairy, chicken and egg farmers affected by the TPP or Canada's free-trade deal with the European Union. The supply management system was not abandoned, but Canada would give TPP members duty-free access to 3.25 per cent of its dairy market and 2.1 per cent of its poultry market. The Dairy Farmers of Canada responded favourably to the deal. "We obviously would have preferred that no additional market access be conceded in the dairy sector," Dairy Farmers president Wally Smith said in a statement. "However, we recognize that our government fought hard against other countries' demands. … We have come a long way from the threat of eliminating supply management." Canadian officials highlighted the potential for gains in seafood exports under the TPP deal. Background documents highlight the fact that Japan has traditionally been known "for its high per-capital consumption of fish and seafood." Japan has committed to eliminating 66 per cent of its fish and seafood tariffs once the deal is in place. Snow crab, lobster, shrimp, salmon, scallops, halibut, mussels, tuna and oysters are also listed as Canadian seafood products that will gain easier access to TPP markets. Free trade and forestry hasn't always gone smoothly for Canada. The dispute-resolution clauses of NAFTA were invoked in the past to sort out differences between Canada and the United States over softwood lumber. The Forest Products Association of Canada called Monday's TPP deal "an important boost" for Canada's forest industry. The lobby group noted that Canada currently exports more than $22.6-billion of forest products a year to TPP countries and that is now expected to grow because of the deal. Industrial goods like farming and construction equipment as well as aerospace products would get quick access to TPP markets under the deal. "Canada has obtained an advantageous tariff outcome – the elimination of all tariffs on industrial goods from all TPP countries," states background information released by the Canadian government. The Canadian Manufacturers & Exporters praised the deal and said it would help its members reach the goal of doubling Canada's manufacturing and exporting output by 2030. As the negotiators extended their deadline over the weekend, reports emerged that rules relating to so-called biologics were among the final points of disagreement. Biological products include vaccines, blood and cutting-edge products that combine natural substances. The final deal provides pharmaceutical companies with five years of exclusive use of new biotechnology before having to share that data with generic drug manufacturers. The Biotechnology Industry Association had been urging TPP countries to match the current 12-year intellectual property restrictions that are in place in the United States. The association called the shorter protections "remarkably short-sighted" and warned they would chill global investment in new health research. Bankers, engineers, architects and environmental consultants are some of the jobs that fall under the broad category of services covered by the TPP. The deal will make it easier for employees to make temporary work trips within the TPP region. There are also new provisions to make it easier for workers to bring their spouses on business trips. Canadian officials argue that Canada's banking sector in particular should benefit from the deal. They also insist that the deal allows Canada to protect and promote its existing rules for supporting Canadian culture. "Nothing in the TPP agreement prevents governments from regulating in the public interest, including with regard to adopting measures to promote culture, delivering public services like health and education or providing protections for Aboriginal peoples," the government states in background documents. HOW COULD IT AFFECT OUR TRADING PARTNERS? Pharmaceuticals: Next-generation pharmaceuticals, including cell-based biologics, will have patent-style protections for eight years. That’s in line with Canadian policy, but will disappoint some countries who declared anything beyond five years would be unacceptably expensive for patients and taxpayers. Technology: There are rules in the deal to protect the digital economy, and practices likes cloud computing. It would prevent national governments from cutting off data flows, by limiting laws that require local storage of data. WHERE DID THE PARTIES STAND ON TPP DURING THE ELECTION? Liberal Leader Justin Trudeau, Conservative Leader Stephen Harper, and New Democratic Party Leader Thomas Mulcair take part in the Munk leaders’ debate on Canada’s foreign policy in Toronto on Sept. 28, 2015. Liberals: Before his election victory, Justin Trudeau expressed some support for the TPP, but also criticized the Conservative government’s negotiations as being too secretive. He says a Liberal government would carefully evaluate any trade deals signed by the Conservative government. Conservatives: The Conservative government officially joined negotiations for TPP in 2012. Stephen Harper championed the TPP deal, saying that refusing to get on board would be a “disaster,” cutting off Canada’s auto industry from global supply chains. He cautioned, though, that the auto industry would not like everything the deal entailed. NDP: New Democrat Leader Thomas Mulcair said the TPP deal could hurt Canada’s agriculture and manufacturing sectors, and wrote to the International Trade Minister that an NDP government would not consider itself to be bound by the deal.